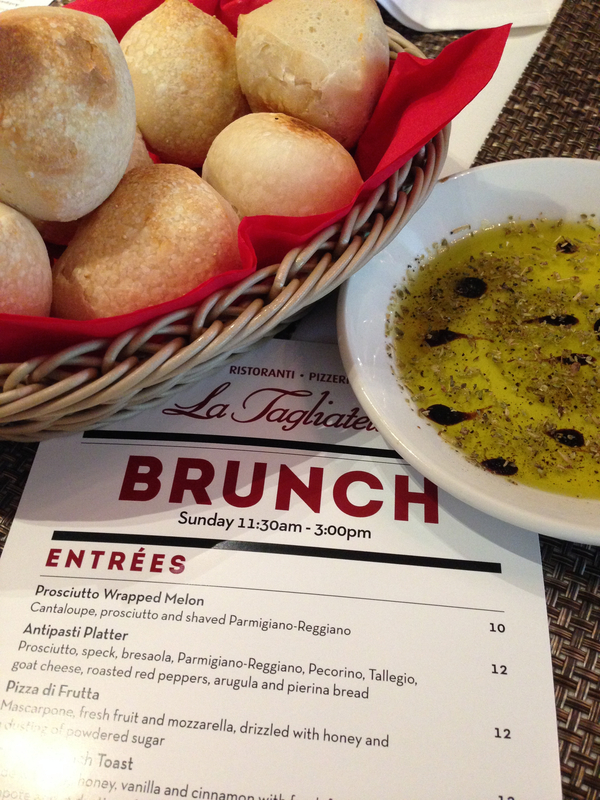 For Mother’s Day, we headed over to Emory Village with our youngest and her boyfriend, for brunch at La Tagliatella. 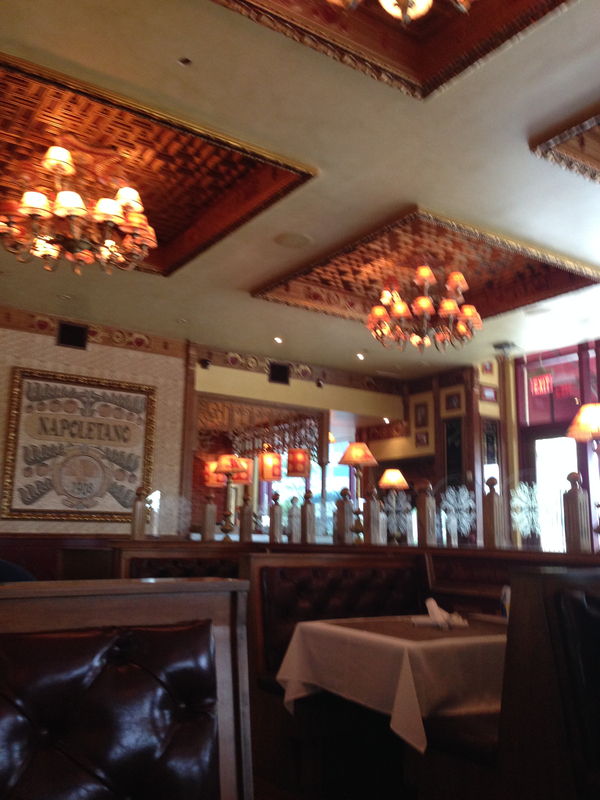 We had originally considered a visit to La Tagliatella when we were downtown several months ago, at their midtown location. 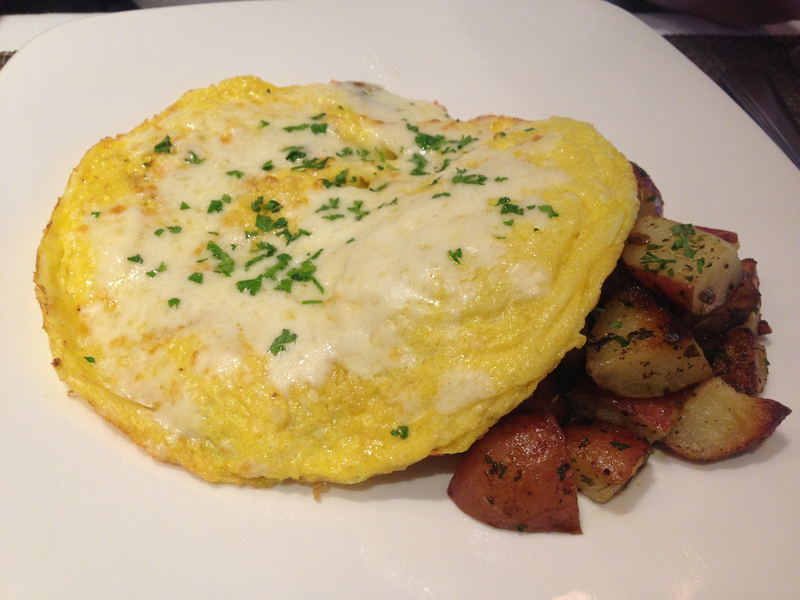 I discovered, when I was writing this blog post, that the midtown location closed at the end of March. What I also learned, that surprised me, was that La Tagliatella is part of a global chain with five US locations and more than 165 other locations in Asia, Europe and India. Interesting. The brunch menu is fairly limited, with a total of less than fifteen dishes (three of which are fritattas and none of which are traditional pizzas), so we asked for a dinner menu as well, from which three of us ultimately ordered. Knowing that they are a part of a massive chain, explains a lot about the decor. We were started out with a basket of rolls and olive oil and balsamic (which looked like tadpoles swimming in the oil) for dipping and water, then left alone for quite a while. Sometimes you have an exceptional service experience, and other times you get today. Eventually we ordered soft drinks (and, ultimately, got three of the four that we ordered) and ordered our meals, then sat there, again, for quite a while. This did not appear to be an issue with service in the restaurant overall, as we saw other people getting decent service. It seemed to be extremely localized. We did have one weird moment, pre-food, when he was refilling water glasses (between ordering the sodas and actually getting them, we required a refill on water): the server didn’t want to pour into one of the glasses where we had moved it closer to him, to avoid putting his arm into someone’s space. But he would have to reach across the same person to get to the glass where it originally was sitting. Personal space didn’t appear to be an issue, as we later found. My pizza arrived first, alone. And I was afraid that the rest of the meal wasn’t going to appear, but it did arrive in the next two or three minutes. And then the server said “Enjoy yourself and make me proud.” Seriously – he actually said those exact words. which obviously had pancetta, but also caramelized pearl onions and cheese, served with roasted potatoes. She said it was okay. Jo chose a parmigiana and black truffle light cream sauce, topped with shaved Parmigiana-Reggiano, a fried egg and truffle pearls (these pearls are actually seaweed globules, containing truffle oil, to resemble roe). 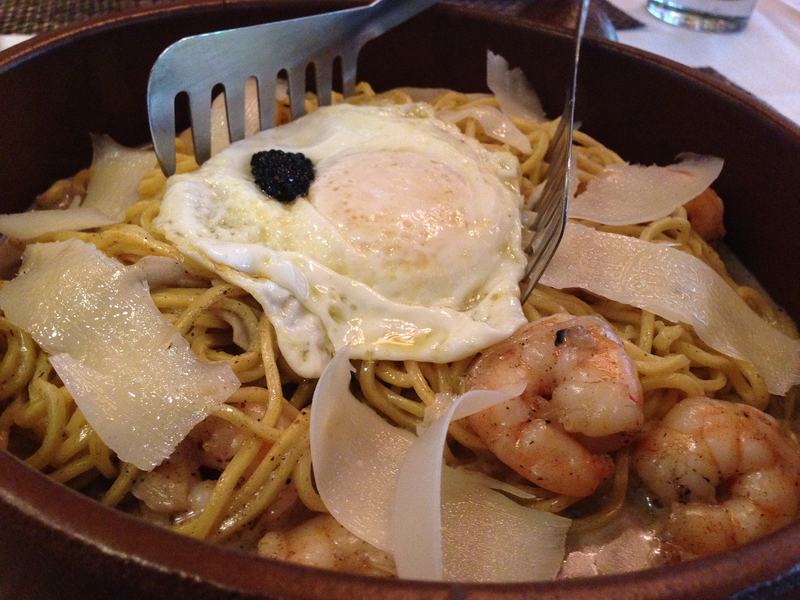 She ordered this served over a bed of house-made taglierine, with grilled shrimp. It was okay as well. The presentation was not terribly appealing. 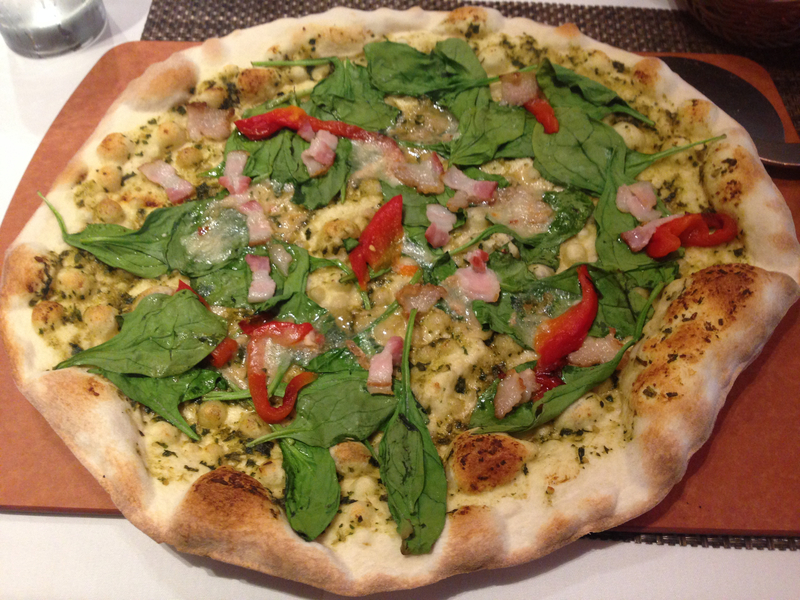 And I chose a cinque terre pizza, with pesto, red peppers, Taleggio cheese Tuscan bacon and fresh spinach. It usually has onion and mushrooms as well, but I held those. The pizza was extremely thin – so much so that I poked my finger through one of the air pockets and shards of crust flew everywhere. If I had read the description more carefully, I would have read that there was no tomato sauce on it, but that was my fault. It was different, but fine. I gave him my hand and he shook it, thanking me for coming. Then he attempted to shake Jo’s hand. This was the crowning glory in a series of awkward moments. Overall, the meal was fine. But, there are plenty of places to have a better Italian meal for equivalent money. I’ll be surprised if they stay open until the end of the year.